What Makes a Thing a Thing in Crosswords? A few months ago, there was a debate amongst the solvers and readers of The Guardian’s Crossword Blog concerning which words are fair entry fodder for crosswords. I wonder if all the clues that are giving some sort of synonym for a chess piece are quite playing fair (including my own). Obviously, it’s a chess piece, but it wouldn’t be in a crossword because it’s a chess piece. If I solved a puzzle and found BLACK PAWN to be one of the solutions I’d feel a bit miffed. I asked Penny Press Editorial Director Warren Rivers about this very subject, and he mentioned that WHITE KNIGHT would cause him no issue — it reminded him of this Ajax commercial — but an entry like WHITE ROOK would be a problem, because it’s not a standalone concept (as far as he is aware). It’s an intriguing discussion, all centering around arbitrariness. 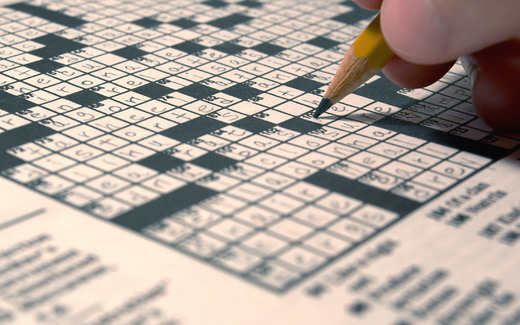 Should the determining factor of “crossword worthiness” be whether the entry can be found in a dictionary or another reputable source, like Brewer’s Dictionary of Phrase and Fable? Does a textbook definition make a thing a thing? Not necessarily, as slang, phrases, partial phrases, and anecdotal entries make it into puzzles all the time. In the Lollapuzzoola puzzles we looked at recently, entries like ONE-NIL, NASCAR DAD, SIREE (as in “no siree”), NO REST (as in “for the wicked”), and TELL ME THIS all appeared as answers in grids. Would you accept all of these as fair entries? Most of these wouldn’t pass muster in Penny Press puzzles. The partial phrase, of course, opens up an entirely different can of worms. For instance, would you be upset to see “At a ____” cluing LOSS? Probably not. But what about “At ____” cluing ALOSS? Maybe so, maybe not. Where do you stand on this issue, fellow puzzlers? Is there a particular cluing or entry style that bugs you? Do you have an example of something that made it into a puzzle recently that doesn’t hold up to scrutiny? Or does nothing come to mind? If so, does that mean the issue doesn’t bother you at all as a solver? Either way, let us know in the comments below! This entry was posted in PuzzleNation, Puzzles and tagged black pawn, Cluing, crossword, crossword blog, crosswords, debate, DIY puzzling, Geeking Out, New York Times, New York Times Crossword, Penny Dell Crossword App, Penny Dell Crosswords App, Penny Dell Puzzles, Penny Press, Penny/Dell Puzzles, Pop culture, PuzzleNation, Puzzlin' fool, the guardian, The Guardian Crossword Blog, white knight, Wordplay by gmdirect. Bookmark the permalink.